Many people experience panic attacks and there can be various and very individual triggers for their attacks. Regardless of the stimulus, panic attacks are very frightening and debilitating and can make day to day life a real struggle.Panic attacks are very often experienced alongside symptoms of depression and/or as part of an anxiety disorder. A Panic attack contains emotional, biological and psychological reactions. 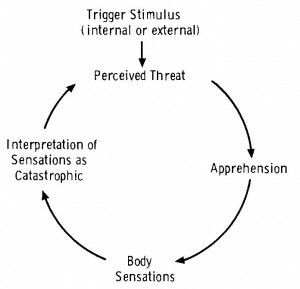 It begins with an emotional reaction (anxiety) to a stimulus, which in turn is the natural catalyst for a biological reaction i.e. what we feel or experience physically. We then experience the psychological reaction i.e. our thoughts about and interpretation of the emotional and biological reactions. The triggers for panic attacks can vary from person to person, sometimes being very tangible, like a fear of flying/open spaces or a cat phobia. But for a great many people the trigger is not external to them, but is actually their thinking. A certain mode of negative thinking is the trigger for their emotional reaction. How we think determines how we feel and by that rational; for some people, their thoughts have the power to induce the same level of anxiety (emotional reaction) as an agoraphobic might experience in the center of a busy shopping center. When we encounter our stimulus whether it is internal (a negative thought) or external (e.g. heights) we become anxious (emotional reaction). When this happens our ‘fight or flight’ response kicks in mentally and we send messages to our body that we are not safe and that it needs to protect itself. Thus begins the various physical symptoms (biological reaction) we experience in a panic attack e.g sweaty palms/ quicker breathing/ butterflies in the tummy etc. When we experience the physical symptoms in conjunction with the original feelings of anxiousness, we may feel even more panicked, about all that we are experiencing. We may misinterpret our symptoms as more catastrophic than they actually are i.e. thoughts that we are going to faint/die. Any interpretation of these symptoms is our psychological reaction. This psychological reaction generally goes on to cause more anxiety and the panic cycle continues….. It is strongly felt that it is our interpretation of our initial, emotional and biological reaction, which maintains and strengthens our panic and that if we change the way we interpret our initial symptoms of anxiety we can stop a stimulus induced, feeling of anxiety from becoming a Panic Attack. Panic Attacks are extremely frightening for those who experience them and can make the sufferer feel very isolated if they are not sharing their experiences with others. It can feel difficult to tell others about what you are feeling when this happens for you. At Counselling Carlow you will be facilitated as you explore what has been happening for you and what you have been experiencing. You will be met with the understanding and the concrete belief, that each of us is different and experiences the world differently.